LeBron James and the Cleveland Cavaliers became the first team in NBA history to come back from a 3-1 deficit to win the championship, beating the Warriors in Oakland on Sunday night in Game 7. The Cavaliers’ championship marked the first time in 51 years that a Cleveland team won a major trophy. 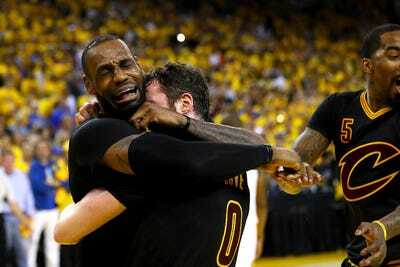 After the final buzzer sounded, James found himself kneeling on the hardwood, overcome with emotion. He stayed there for a few moments, then celebrated with his teammates. When he spoke to ESPN’s Doris Burke, he again broke down in tears, thanking God and eventually shouting out his home state. “CLEVELAND, THIS ONE’S FOR YOU,” he screamed into the microphone. The whole interview is worth a watch. James also won his third Finals MVP award. During his acceptance speech, Burke asked him what was special about this particular championship. “Because I’m home,” he said.